The following may be old news to some of you, but I found it interesting enough to share it via this blog. Also, because there may be others out there who have a faulty TFT screen. 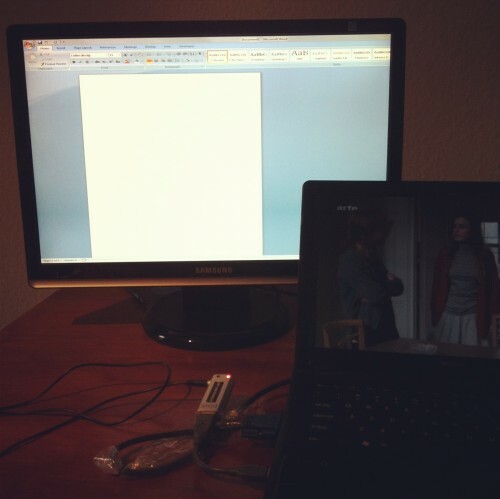 Apologies also for the poor picture quality – taken while in action, with little regard for potential blog content. “You can have my old 22″ TFT Samsung display”, a friend of mine recently told me. “It’s somehow broken as it often doesn’t show a picture, sometimes only after a while, but in most cases it’s just dead”, he wrote. “I will throw it away or you come and pick it up.” So we picked it up. It was the first time I opened such a huge TFT and also the first time I immediately found the cause of this failure: worn out electrolytic capacitors. A quick Google search then revealed that these capacitors are indeed the culprits, and that I am not the first one who has a problem with such a Samsung display. In fact, there’s a complete shop online (in German) that only sells electrolytic capacitors for each Samsung display and other devices. That’s pretty amazing considering that Samsung probably lost a great share of their reputation due to saving on these relatively cheap components. Alas, this unfortunately also happens with a lot of their competitors and I think it’s all part of the planned obscolescence. So the good news is: you can fix it. If you own a soldering iron, you can just buy a set of electrolytic capacitors and replace them yourself, or get a new/refurbished AC power supply unit board from a dealer in China via eBay and just swap these boards. 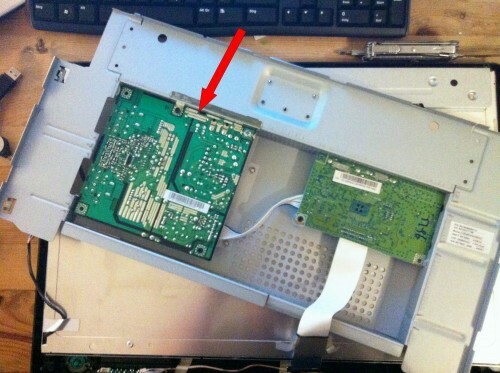 There are just six screws and a lot of people have this done before and successfully repaired their TFTs. On the pic above you’ll see the old (blue) capacitors of which some are obviously broken – something known as “capacitor plague” – with open vents in the top of the can. You sometimes also don’t see the damage, so if you’re replacing some, it may also be smart to just replace all of them with a brand of higher quality. 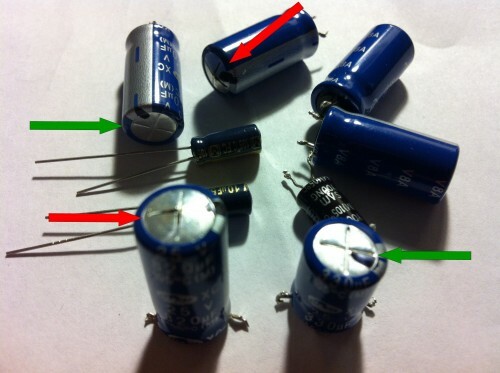 Such higher quality capacitors are visible in the picture – two small black ones (in the middle) which I didn’t replace for technical reasons. All in all, just a repair of 20 minutes. Or if you have a replacement for the power supply unit board, it’s even quicker. Et voilà, the fixed display, just moments after the repair was done. Again, anyone can do this and if it can be fixed, then please fix it. Some things are just very straightforward and simple. I also never knew that the Capacitor Plague did have SUCH an impact, that there are sites dedicated to capacitors and that the cause for all of this (which is said to be industrial espionage) is in fact very far-fetched. Congratulations. 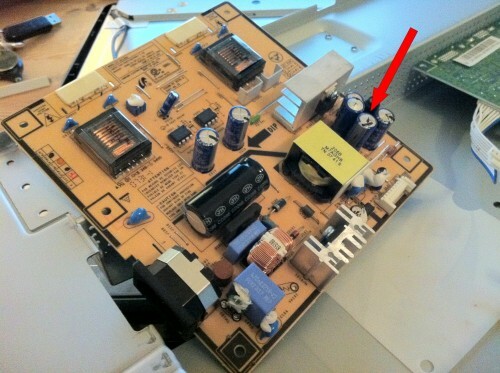 Okay, if you can see an obvious problem, like the open “vent” at the top of a capacitor, it’s pretty straight forward. But otherwise, how did/do you find the faulty parts? I once had an old board for a coin-op arcade machine (“Arkanoid”). The thing had a strange defect: it worked very well for around ten to fifteen minutes, then all of a sudden the image went “running”, as if the V-hold was misadjusted. Needless to say that trying to adjust the v-hold didn’t help at all. My first guess wass that the Z80-cpu was overheating, so I installed a provisoric ventilator. Didn’t help either. So I replaced the quarz, thinking that it may have gone faulty and was mistiming the refresh-rate. But that was also not the problem. So finally, I assumed that an electrolytic condensator may be spoiled. But having no clue how to find the damaged one(s), and not wanting to exchange every single one of them, I put the problem aside “for a while”. Which means it went into a box of other projects and disappeared into a closet for the next year and a half, while I was busy with other stuff. Unfortunately I couldn’t find out anymore what had been the cause, because my personal situation was changing at the time, I had to move houses all of a sudden, and the defect board had to go on ebay together with plenty of other treasures.